Mamas… Don’t Let Your Babies Grow Up to Be Girls Scouts! So your little girl wants to be in Girls Scouts…. awwww. I am guessing that she is probably in the first grade, and some Moms have gotten together and decided to start up a Daisy troop with plans to lead those girls up through the ranks… from Daisys, to Brownies, and on to Girl Scouts. 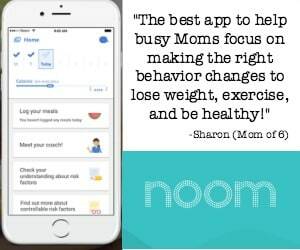 The Moms have enrolled in a Leadership Training Course, have gathered together all of the necessary forms, and have called a meeting for parents of potential members. And your little one is looking up at you with hopeful eyes asking if perhaps she can be a Daisy Girl too….. But Mamas….. I'm warning you…. don't let your babies grow up to be Girl Scouts…. Oh sure, the sisterhood and the activities are great… and yes, your daughter will definitely learn the values of friendship and community. She will gain exposure to all sort of cool crafts and fun things to do…. she'll proudly sell the cookies, hold hands with the other troop members in the closing circle, and say the pledge that promises dedication to all kinds of sweet ideals. But there is a Dirty Little Secret…. one that you won't find on any permission slip or in any handbook. And I am here to share that secret with you. Being a Mom of a Girl Scout means that you are committing yourself to hours being enslaved in one of my most hated activities of womankind…. ironing! All in an effort to iron-on a bunch of damn patches onto a polyester vest! So before you sign on that dotted line… just make sure you know exactly what you are committing yourself to…. Now I don't know about you…. but I don't even iron my own laundry, until I reach a state of absolute and final desperation. All of your wrinkly clothes just sit in a pile for weeks on end until I run out of shirts to wear. My husband has long-ago figured out that he better rely on the local dry cleaners vs. his adoring wife if he actually wants to wear shirts to the office. I personally feel that ironing is on par with toilet cleaning in the “fun department”, and I have 4 sons…. so I think you know how I feel about cleaning toilets. Really, ironing is a 1950's throwback activity, best done while wearing an apron, sipping a dry martini and watching soap operas. While I have embraced many other aspects of modern-day housekeeping (cooking, cleaning, blah, blah blah)… ironing isn't one of them. What exactly are these patches for, you ask? So what's the big deal with ironing on these patches? So they hand out these iron-on patches…. but they don't have the sticky stuff on the back that should “activate” with a hot iron. They are just.. patches. So you start spending your free time on Google looking for an “easy product” to use to create the sticky backing….and find that there is actually a product called “Badge Magic”… and the magic must lie in the fact that you need to chant certain words when you use it, because it only works part of the time, generally when I am cursing under my breath. And just when you think you've got the whole “iron-on” thing figured out, your daughter comes home from her troop meeting with a memo that explains that you've been putting them in all the wrong places! Whaaaat? Now you have to figure out how you are going to get the damn things back off! 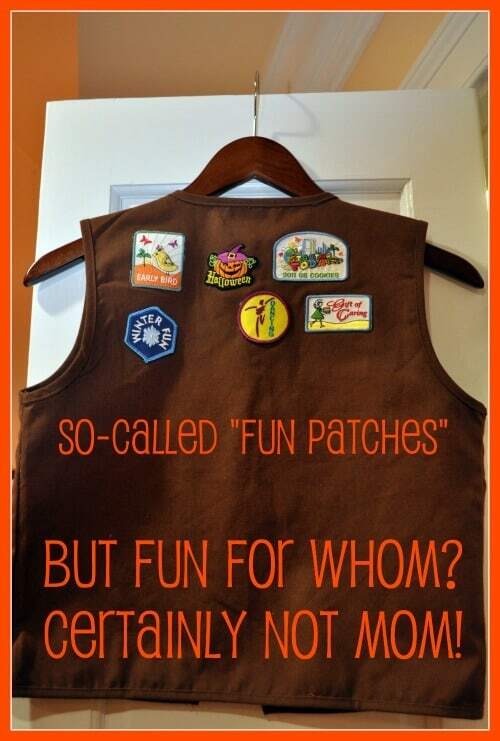 Oh, and don't allow your daughter to actually eat her troop snack while wearing the vest… because Lord knows if it gets dirty and you have to wash it- all of the damn patches will be floating around in your washing machine….. shrunken and once-again, unattached! You have to decide if all of the joy and fun and friendship-building for your daughter is worth your commitment to actually iron on a slightly-more-than-annual basis. As you can tell…. I made the sacrifice. But you, you still have time to save yourself. Disclaimer: My daughter adores being a Brownie and would be mortified if she knew her mother has taken to her blog to bash the very institution that brings her so much joy. So let's just keep this between us, shall we? And perhaps not share it with her troop leaders who work far too hard for these girls to have their efforts squashed by this ungrateful Mom who hates to iron…..
« Best Ever Homemade Deep Dish Pizza! I was a coleader for two years. It seemed like I was supporting something great, because everyone was saying how wonderful it was for girls and women. In retrospect, I feel it can actually hurt them. The organization really needs to make changes and “grow up” versus fighting over Scouts of America over children who benefit from more choices. When I quit I gave my daughter the option to stay with the troop, but she quit, too. It turned out she was just going along with it mostly because I was leading—not because she was really enjoying the activities (though she seemed to have fun at a couple because she liked some of the other girls). I have a love-hate relationship with Girl Scouts. I’m glad we tried it, and I think everyone should give it a try as each troop is different and there are stories of ones that have amazing leaders who do empower their girls. However, from what I’ve experienced and seen other friends go through, most of the time it seems to be a big money and time pit for people who have enough money to get themselves into trouble. We left, because I didn’t like the commercialism or peer pressure cookie selling competition that was part of our troop. Most of the fanciest GS sponsored activities in our region were to gear the kids up to sell cookies, and we wasted half our meetings teaching our Daisies how to take money. That seemed kind of slimy to me. Also, the stories they were read to help earn their petals seemed really contrived and dumbed down, too. Our leader and other people who assigned activities would often give them crappy Pinterest projects to do (I hate Pinterest at this point). Bless her heart—our leader was dedicated and I do appreciate that she invited us, but she was pulled in 4 different directions in her life and didn’t delegate well. The super competitive new “cookie mom” wanted to take over our troop, but after she took over my position I heard she quit the very next year. Overall, it caused a lot of unnecessary stress and drama for very little return–especially during cookie selling season. I dearly miss the sweet girls in the troop. I loved helping them beyond reading the stupid Daisy books and teaching them to be cute little cookie selling slaves. However, I don’t feel it was empowering as it could have been…more like a weekly girls social group. I’d much happier spending my free time taking our daughter on family trips to meet women who are doing things she wants to do (science, music, art, etc…) and letting her have some kind of regular playtime/downtime with friends so she actually has time to be a kid versus taking her several times a week to events to teach her to be a future corporate drone or housewife who feels trapped into her role because she couldn’t find something that fulfills her life beyond parenthood. No offense to any women in those roles, because they *want* to be, but a lot of people let themselves be trapped into it and be miserable order to “fit in,” and the that is the mentality I find Girl Scouts projects (even on the corporate level) that is off-putting. I hated it too, until I started in an art that involves melting things. It’s tedious if you let it be, but if you set aside the time, deliberately, to do it, and meditate on how you support your kids’ accomplishments, just because you’re their mom, it’s not so bad. It’s a moment to slow down and think for a few minutes. It put a whole lot into perspective for me. GS might seem fluffy, but it’s a big deal in the grand scheme of things to raise a daughter, and to have to community and resources to do it right. I am a leader with a daughter who never met a patch she did not want to earn, lol. The secret to attaching all those hard earned patches and badges is to crack a good bottle of wine and turn on a good movie. Then I like to iron then on to position them and tack them down with just a little thread. I am talking corners and a stich or two in between. So while I feel your pain, I encourage you to make some lemons into Lemonade. What was once a tedious chore can become a great excuse to put up your feet and enjoy a glass of wine! And the best bonus is seeing the joy and pride on your daughter’s face when she wears her vest covered with her achievements! Cheers! 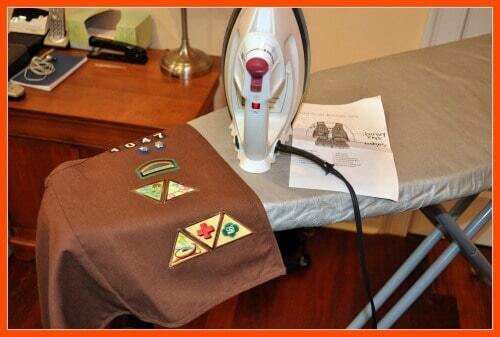 I am a troop leader and I also do not mind ironing. But I do admit that one of my pet peeves is when Girl Scouts have their badges or patches in the wrong spot on the uniform. What I do is collect vests at the end of a meeting and put the badges on for the parents – usually during a long TV program – because it does take a long time to get those babies to stick well. I also put them on as they are earned, because I agree with another commenter – the girls want to see their badges on their vest, not wait until the end of the year. Especially if they are moving up next year. When will they get to wear their fully-adorned vest ?!? I’m a troop leader if an active multi-level troop with FOUR daughters in our troop… 1 daisy, 2 twin Brownies and a Junior. I feel your pain. Oir vesta over flow at the end of the level, i have a bag of fub patches that didnt fit at all on the twins Daisy vests and I am always behind… because I’m planning meeting and activities for the troop and raising 4 kids. I do use a hair flat iron to put them on… back and front at the same time. Hot glue gun those babies!! You all need to get a life. It is a humorous look at a situation in life, not a criticism of women or life. I absolutely loved this post. This blog actually lets women know, it is alright to dislike sewing on badges. It is not demeaning anyone in anyway. I applaud everyone who likes to sew, I do too. However life is frustrating, laugh about the frustration, it helps you love the life. You are not understanding the point of Girl Scouts. And, perhaps there is someone in the troop that likes to sew on patches? For me, I am the leader and I sew on EVERY SINGLE GIRLS’ patch – ALL the girls in my troop and it does NOT take that long at all.I can whip out 5 patches in 20 min or so on the sewing machine and I do it in the morning before I got to work. AT one point I had 16 girls in my troop. All the moms appreciate it and I find it relaxing. AND the girls LOVE to show off all their accomplishments and travels. They work hard for the patches and badges they earn and enjoy people asking them questions about them when they are seen. Please don’t make a decision about scouts based on the patches. You can also get “patch attach” which is a sticker that attaches everything. It is really not that big of a time waster. You waste more time surfing Facebook each day. This is definitely more worth the time! When they get a little older I am going to teach them all how to do it. I too sew on my daughter’s patches. I wanted her to, but they were way too physically hard to get the needle through the badge. She now sews other projects while I sew on her patches… AND i just got 10 more on Saturday from the troop leader. Cookie patches are just finishing up – more to do, then we’re onto brownies! Love this! I’m a Girl Scout Leader who’ll be teaching the troop to sew their own patches. It’s a win-win. 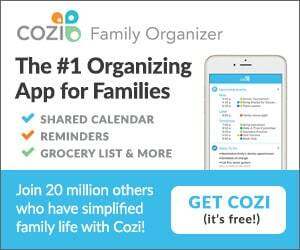 They work toward the Independence badge, and parents’ lives are simplified. I have two daughters of my own in the troop, so I’m all for them doing it themselves! This is definitely a late post to this blog, but I found this while searching for ideas to re-craft my old badges. Though I understand the humor in your post, you must know that if you title a blog post the way you did, you are opening a can of worms. Some of your replies to comments ask, “how can you attack another woman,” but by attacking Girl Scouts, whether it was meant to be sarcastic and humorous or not, is attacking women that dedicate their lives to Girl Scouts. Maybe try to keep that in mind when people post their opinions. It is also very important for you to know that Daises and Brownies are not separate from Girl Scouts. Daisies and Brownies are Girl Scouts. They do not “move on” to Girl Scouts after they finish Brownies. They are Girl Scouts from day one. Daisies, Brownies, Juniors, Cadettes, Seniors, Ambassadors. They are all Girl Scouts. When I first saw this post I got very aggravated. We are having enough problems recruiting girls into girl scouting and now I see this post that is telling parents to not join Girl Scouts because the patches are hard to attach. Then I sifted through the comments and I took a step back. 2) The glue on the back of the patches does not work well if you are using a regular iron. I don’t know why, they just don’t. Fabric glue doesn’t work so well either. 3) Badge Magic is the greatest invention, it has worked for me every time. I have even used it more than once. They trick is, badge magic is not meant to be heated. Do not iron badge magic. It will ruin the clothes and not work as well. Cut out badge magic to the correct size, apply it to the patch, then apply it to the uniform and put pressure on it for a few minutes. 4) If that fails, learn how to apply a couple of stitches around the patch. Again, we are not looking for perfection. I stitch at the top, bottom and each side will keep the patch in place, especially if you have used badge magic or have ironed it in place first. 5) If you really don’t want to stitch, or teach your daughter to stitch a couple of stitches (which is in itself a great skill to have), use safety pins. Pin them from the inside of the vest/tunic/sash and you can barely see the pin. It won’t look perfect. But we are not looking for perfection. Teach your daughter how to do this as well and she will take even more pride in her patches and accomplishments. We give girls patches to remind them of the fun we have had and the work they have put in. Girl Scouting does involve a lot of work on the girls’ part and having something to remind them of their accomplishments helps them keep going, especially at the Daisy level, where they don’t earn badges, they only earn their petals. I really hope this has helped. 🙂 Happy scouting! Thanks for posting this Dali. I agree!! 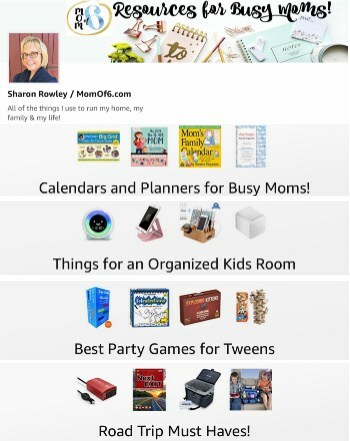 This is just lazy mom who can’t take out the ” precious” time from her blog to help her kid. Thank the Lord she is in the scouts maybe she will learn something. I am a third generation girl scout leader. I have been a scout for over 20 years. My mother and I used to spend HAPPY afternoons at the kitchen table HAND SEWING on my patches. This is how I learned to make small stiching. I was a child of the 80s back when there were a slug of patches. I earned over 40 patches my junior and senior years not including the badges on the back. One vest was packed so full I would rip out old patches and scoot them over to fit them on. Here is the best part. My mother never pushed me to achieve excessive patches I earned them on my own and was filled with pride to see my vest. But not only did my mother help me sew on my patches. She always went above and beyond. Our troop was made up of my sister and I, my best friend ,A single father with two daughters , 2 foster family’s one with 3 girls one with two and one girl whose grandmother raised her. That is 10 girls. Now only my best friends mother could sew. So my mother and I would spend maybe two or three afternoons a year had sewing our ENTIRE troops patches. This would be some where around 80 patches every year. I never complained once. Back in the 70s you had to sew your own uniform and I mean the whole getup not just a vest. And back in the 40s you had to do all that AND embroidery then cutout THEN stich on your badge. YOUR LITTLE GIRL WORKED HARD TO EARN HER PATCH.I can see how ANY mom could be so lazy that she can’t take the 5 mins. It would take to wave a iron over a vest. I certainly admire your dedication to scouting and your lifelong commitment to such a worthwhile organization. But I can’t help but wonder why a woman in a leadership position such as yourself would be so judgmental of another woman. This blog post was written as a humorous piece, and had you taken time to actually read it through to end, and perhaps even read through a few of the comments where I have explained this fact over and over again- you would have realized that and perhaps just smiled, shook your head and moved on. But instead- you decided to call me “lazy”, and assume that I can’t take time from my “precious blog” to help my child. I sincerely hope that this type of flash judgment are not what you model to your scouts in your troop. I hope instead you teach young women how to find the humor in life, look for joy in what they do- and to support rather than judge other women. Sharon, your post was hilarious and you are very diplomatic to some of your “readers”! “Other” Jennifer, get a grip! It’s called humor, find some. I’m glad my daughter’s leaders are not as judgmental as you are! I don’t feel anyone’s pain, the patches go on easy with attention to detail and proper application of iron to patch, little advice after stick the patch to the vest flip it over iron the vest (less material for the heat to transfer through) your down in less then 5 mins! If this is a problem of the modern women then society is lost! i found this entry while looking for where I’m supposed to put my daughters fun patches. And laughed. Then my husband comes in, vest and patches in hand and tells me HE will see them on. 5 minutes later he decided to take it to the local scout shop and pay for them to be sewn on! He didn’t realize just how many there were! Totally funny!! Thanks for the FUN! What a horrible outlook! Sure glad your attitude is no where near my girl scout troop. Sew them on – or have someone else do it and your problems are solved. It’s just as simple as that. Thank goodness we were not born in the days where ironing and sewing wasn’t an option but a necessity. I’m sorry I’ve been a Girl Scout all my life sewing patches, badges on my uniform, and now my daughter’s. All I can say is buck up and just do it. Let’s be proud of their achievements and let the patches represent the experience our future leaders have earned. Yea I get it that this was a joke, but really, is it funny? I thought this was hysterical and I am a longtime leader of 2 troops – Brownie/Junior and Cadette/Senior. I am one of the few weirdos that actually likes to iron, but those patches still don’t stick! Out of frustration and disgust at the ragtag appearance of my Scouts, I started machine sewing them on for a fee. My first year as a leader, my co-leader actually glued the American flag onto her sash upside down! I take them home at the end of meetings and return them at the next. I also take in other troops’ vests at a slightly higher fee. I am a little OCD, so I get a strange satisfaction from having the patches and badges all lined up properly, the girls always look their best and the parents are gleefully off the hook! This was the funniest post I’ve read in a LONG time! Thanks! I live in AZ, and am willing to sew patches on vests for .50/patch….vests and patches can be mailed to me in a flat rate envelope with a SASE for returning of the vests. I use clear thread and a zig zag stitch with my machine so the patches lay flat and are secure on the vest. I will also make sure that patch placement is correct and utilizes the space available efficiently. If you want more information or to know where to send a vest, please email me at [email protected] and put “Girl Scout Patches” in the subject line. I can generally have the vest on it’s way back to you in less than a week, payment can be made via PayPal :). I’m not sure what dry cleaners charge other places but here it’s upwards of $2 per patch. Iron for 5 minutes? Really?! Selfish much? Jeez this ‘sanctimommys’ with their comments are the worst!! You’re so patient! I don’t know how you put up with these dummies who ‘don’t get’ the joke. I loved you post!! Do not take it personally when someone can’t find the humor in it. I have a junior girl scout, who believes she must participate in every activity that there is. So believe me I feel your pain. I have became a pro and getting the patches on and making them stay. My daughter is trying to reach top cookie seller in our council right now so I’m sure that will be another half a dozen patches 🙂 thank you for the post 🙂 Keep your head up! Thanks Lesley! And kuddos to your daughter on being the top cookie seller! Thanks for the laugh. I came across this post while figuring out how to attach the badges. So Elmer’s glue out, huh? I think so. Probably no on the scotch tape too…. but duck tape might work! Seriously it’s not that bad at all. I am a troop leader of a multi level troop and have 2 girl scouts. It took me a few hours to iron the badges and I also used Badge Magic. Stop complaining. it’s for the kids. Great post! Made me laugh a ton! Actually, in my troop… *drum roll*.. we have a mom who is a PRO at ironing on these patches. We pay her $1.00 per patch/badge or $5.00 vest if it is the end of the year to attach all the patches and badges and they are returned to the girl at the next meeting or at the start of the next year. It is amazing! So convenient too! I know you were being funny, but I really wasn’t too funny. I have no kids of my own yet, but I am a troop leader to 15 amazingly fantastic -beautiful- intelligent- courageous- polite-diligent- strong young ladies. Leaders get no pay, I’m a RN who volunteers my extra time and wants a better society. It takes a lot of time to plan curriculum and keep the girls on top of tasks and If as a parent all you have to do is apply a few patches think that’s pretty darn good trade, and you will get an exceptional young lady. I have never had an issue with using my iron and the insinstructions provided to get the patches to stick permanently on my girl’s vest. As I have parents who dont want to be bothered with putting on a few iron on patches, and I often wash many uniforms because parents just don’t get around to doing that, and my patches have never fallen off in the wash, and I don’t use the badge magic. And why is your daughter’s leader giving out the badges one at a time, as she earns them? You should get all of the earned badges at one time at end of the year ceremonies. That way you can put them all on at one time. Although I know being a mom is a really hard job, I think you ca apply a few patches for the benefit of your daughter. And I think maybe you were being funny, but it just isn’t funny. Wow. Sorry that you missed out on the humor here…..
From one leader to another thank you. You are what the heart of girl scouting is all about. Juliette low would be proud. I don’t subscribe to that logic, and neither do any of the troops around here. I feel very sorry for girls who work hard all year and have nothing to show for it because their leader is waiting until the end of the year to give them their badges. Especially at the Daisy level, when they want to see their flower grow! Wouldn’t they feel self-conscious when they attend Council events and everyone else all around them has badges and they have nothing? In fact, in my Council, we have “Sudden Service” — troops that volunteer to be called on for photo ops, such as a visit to the White House to meet the President. You can be sure that your troop will never get these opportunities if they don’t have any badges on their uniforms. A completely empty vest doesn’t look nice in photos and press releases. So ‘Best Troop Leader Ever,’ please don’t tell me the way it’s *supposed* to be. Maybe that’s how you do it, but it certainly isn’t the only way to do it, and frankly I don’t even think that’s the preferred way. i hate IRONING but i LOVE my daughter so i will iron these dang patches, if i have to. my husband too has learned that if he wants ironed shirts – that’s what the dry cleaner is for. funny post. thanks for sharing. ps. i am currently fighting a lame patch that for the life of me WILL NOT STICK! argh! I just have to say… Thanks so much for seeing the humor in this post! I get emails almost every day with people sending me suggestions on the right way to sew on or iron on the patches. And I have to keep explaining that this was meant to be funny! I just have to say that I am a troop leader and a Daisy mom. I think your post was hysterical and absolutely adorable. People need to lighten up. I love my girls – they are the sweetest most loving little things, but it is not as “easy” as they tell you it will be! I appreciate your honesty and the giggle you provided me tonight while I am trolling the internet in search of things to do with my Daisies!! Keeping track of patches and journeys and what goes where and how to attach it and EVERYTHING else that goes along being a Daisy parent – let alone a troop leader – can be exhausting. It’s nice to be able to sit back periodically and laugh about it – thanks for the giggle!! Thanks so much for leaving me this comment! I’m glad that I gave you a chuckle- and your note has totally made my day! Hi Jessica! I know it can be confusing! The only things that get moved are the membership stars (the little gold stars that go under the troop number), the Trefoil pin (the blue and gold pin that’s on the yellow ribbon), and (if she earned it) the “Summit” pin. The stars will be positioned under her troop number on her new vest, the Trefoil pin will go on her new brown ribbon, and the Summit pin will go on the vest right under the brown ribbon. These will move from vest to vest as long as she is in Girl Scouts. She will also get a “Bridging” award (a patch that looks like a rainbow) – that goes on the Brownie vest, not the Daisy vest. The main Girl Scout site has a pretty good “where does stuff go” guide: http://www.girlscouts.org/program/basics/for_volunteers/where_to_place/brownie/# If you look it over carefully, you’ll see that these are the only things that are on both the Daisy and the Brownie vests. Wow. I’m sure this has been said before, but: a sewing machine works wonders on those patches. You can usually score a perfectly good used one at the Salvation Army (or similar) thrift shop for about $25. After all, all you need is a zigzag stitch – it doesn’t need to be able to download the patch patterns from the internet and embroider them on by itself. Or, you know, how my mom sewed my GS patches on? With a needle and thread? As for the supposedly iron-on plasticky stuff not being iron-on-able, the fun patch catalog usually specifies whether a patch is a sew-on or an iron-on: not all that is shiny is designed to melt with your iron. But either way, a little fusible webbing goes a long way; you can get it at WalMart for about $1.29 per yard – enough to completely cover the little uniform in patches twice over. Heating up the fabric for a few minutes with the iron before sticking the patch on also helps greatly. As a Daisy leader, and a mom, and a former Girl Scout, I can only hope that your post was crafted to be… humorous… as opposed to…uh…well, really negative and sad and kinda mean. It’s really not that hard to get the patches on, particularly if you follow the directions on the package. Don’t fret. Reading comprehension is hard for some people. So is humor. It was clear that it was tongue in cheek…especially with you extremely clear disclaimers. I know it’s for fun (and it is funny!) but I figured some tips couldn’t hurt others who are equally frustrated and overwhelmed. I’ve actually found using my sewing machine to be the fastest way for me. It does a nice job and I know the patches won’t fall off. I quickly found that if I didn’t sew them on THAT DAY, they piled up and became a huge job quickly! Then I really began to hate it. Now that I force myself to do it ASAP, it’s not so bad. Since my daughter is only a Kindergarten Daisy, I figure I have many (MANY) years ahead of sewing on patches. I agree, Kathy. I went straight to the sewing machine as well. As per my awesome mom’s advice, I just use a glue stick to put each patch temporarily in place, and then sew with whichever color thread matches the rim of each badge. My mom taught my daughter how to sew on her own fun patches! Such a “Girl Scout” way to handle it: Have the girls help! But I am currently working on all the Brownie and Journey patches which require more precision. I had to do my son’s Wolf Scout patches last week. It takes an hour or so, and yes, it’s hard if you’re like me and not a regular sewer! Don’t expect perfection. It’s really time consuming, but at least now I don’t have to worry about washings. Most “uniform” stores – the ones that sell police officer uniforms for example – will sew them on for you. Your police departments information line (not the emergency line!) can help you find such a store. Many dry cleaners / tailors will also sew them on. If the patch truly has no iron-on coating on the back, try fabric glue. Any fabric store will have it. It stays put during the wash! You can also try this with the iron-on patches but it doesn’t work as well. If you decide to sew them on yourself, try using a sewing machine. You can get “invisible thread” at most fabric stores – it looks like thin fishing line – and it saves you from having to match the patch color. You can use any thread you want for the back side (bobbin) – heck a contrasting color can make unpicking easier if you need to remove the patch. If you sew them on by hand, use big stitches. The point is to make sure the don’t fall of, not win a prize for neat stitches. If you iron them on, FOLLOW THE DIRECTIONS on the package. Lots of the moms in my daughters troop have had patches fall off simply because they “knew how” to iron them on and didn’t bother following the instructions. The moms that followed instructions haven’t had any problems. Oh – and for the fun patches… Another mom suggested we start putting them on at the bottome edge. Girls often have long hair and patches at the top of the vest can’t be seen. Hi Kathy! Thanks for all of the tips! This post was really meant to be mostly funny…. and I’ve done okay with actually keeping the patches attached to the vest so far. But really- the girl scouts could surely come up with a better patch… one that actually has an iron-on backing, don’t you think? I hate when simple things are made harder because of a poor design process! I am all about doing things simply and doing them well! But honestly- this post was truly just meant to be funny…. I feel your pain. But, a hobby store introduced me to the best thing for patches– a product called patch magic. You cut the sheet to your badge, put it on the badge, press the badge into the smock, and then put it in the dryer on low for 20 minutes. No ironing needed! It is a wonderful thing!!! Did they stay on with this? 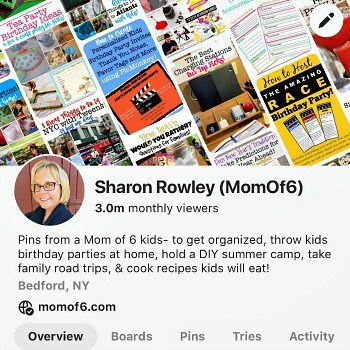 I’m a new Girl Scout Mom… I didn’t find this blog until after we joined or maybe I would’ve rethought this whole thing. My idea of ironing is the “wrinkle release” cycle on the dryer! Wow I am horrified at your reactions about patches, I personally have never ironed a patch and while kids aren’t old enough for scouting yet. I was a scout and I either hand sew or machine sewed on every patch I worked really hard to earn from vest to vest and from old vest to a scrap-keeping patch jacket. My kids do the build and grow clinics for which they receive patches which I hand sew on as well it takes like 30 seconds max a patch. Awana and Jr. naturalist programs at state parks also provide patches. I really hope that your kids never have to see this as I am sure it would break their poor hearts to see how much people hate the awards they have worked so hard for. Just found this blog while trying to find where to iron/sew the songfest, world peace, some triangle badges on the brownie vest. My daughter is lucky enough to have a mom that loves to sew, aka me. I loved this blog, it laughs at the small frustrations of being involved in our children’s activities. I don’t feel like it attacked anyone. It applauded moms who support their children, even when it requires ironing. I sew them on, but the hardest part is placing them in the correct spot. Heaven help us if we should get it wrong!!!! We might be judged. I am willing to sew on badges for any child. I no longer have little ones and find pleasure in giving any mom more time with her daughter. I wish I had it to do all over again even the boy scout badges! Thanks Linda! I wish I had your talent for sewing! My mother in law now brings her sewing machine when they come out for a visit so my girls can get a chance to make things with her! I love it! Yes- this post was just meant to make us all laugh. Parenthood is awesome but also challenging! And if we can all have a good laugh now and then, it makes it easier! 30 seconds… that’s it, you are hired to be my mom <3 I hand sew my daughters on, but it takes more then 5 minutes per patch/badge. I try and sew each area using the color thread that part of the patch/badge is… I know crazy! I’m with you Sarah. It may be all good and fun for the mums to have a laugh, but what happens when your kids are old enough to internet independently and find their mum’s “funny” blog? I don’t care how loved they are, mocking your child’s interests undermines them. I wish more parents understood that children are people with emotions not just pawns for likes & shares. Katie- my kids are currently ages 17-12 and therefore are old enough to “internet independently” as you say. And fortunately- they understand humor and know that my posts are sometimes meant to be funny and most often meant to be supportive of busy Moms. I have known for their entire lives that they are people with emotions and have never been pawns for likes and shares. It’s a shame that you can’t see that sometimes we all need a laugh! My son is in the Scouts and when he outgrew his scout shirt, the patches had to be transferred. Not by ironing though but hand-stitching! Horrors!! I can’t sew to save my life so his new shirt is still unadorned as we speak. Just waiting for a stiff note from the Scouts master now. I am telling you, some entrepreneurial person out there could make some good money by offering this as a service. They could pick up the vests after the meeting, clean them, iron or sew on whatever new badges have been earned, and then deliver them to the next meeting! And the scouts could earn the money to pay for all of it! Brilliant, right? We found a mom how was willing to donate time and sewing machine to sew in everyone patches… We charged the girls $1 for each item and had start up money for a council event the girls wanted to go to. Also a friend of ours has. Local notary shop sew her daughter’s vest. They are one of her biggest customers come cookie sales. Thanks for the great article. I completely feel your pain. Although I do not have any daughters, I have two wonderful boys who are in Boy Scouts and I can assure you that their badges are the same. Thank you for making me smile this morning. Ha ha ha! I didn’t realize that Mamas should ‘t let their babies grow up to be boy scouts either! There’s a trick – wash the vest first, and they stick better. Also a good time to introduce your kids to an iron!